Next Saturday, October 28, is Pit Bull Awareness Day! 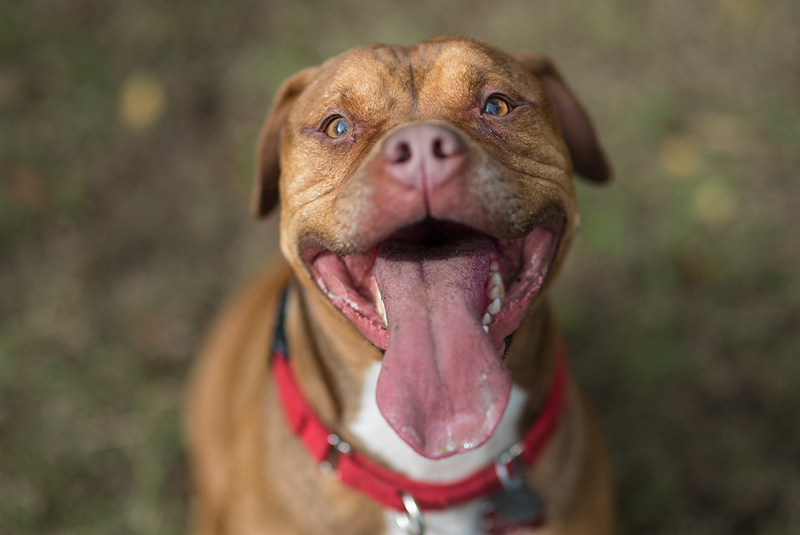 As we celebrate the love we share for pit bulls, we hope that Juice’s story helps inspire those looking to adopt a dog to keep their minds and hearts open to this misunderstood breed. 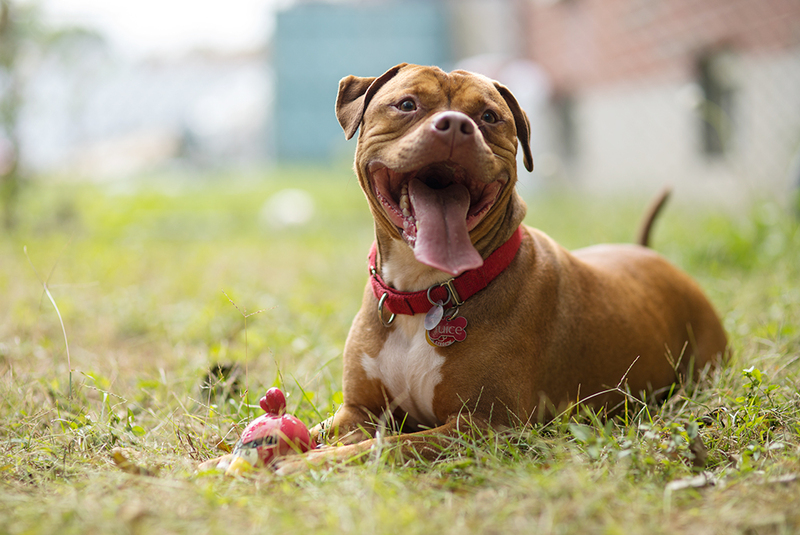 When we first walked up to the family home of Gemar L. in the neighborhood of Jamaica, Queens we were greeted by an enthusiastic, 63-pound pit bull whose 100-watt smile looked as though it could have lit the New York skyline. 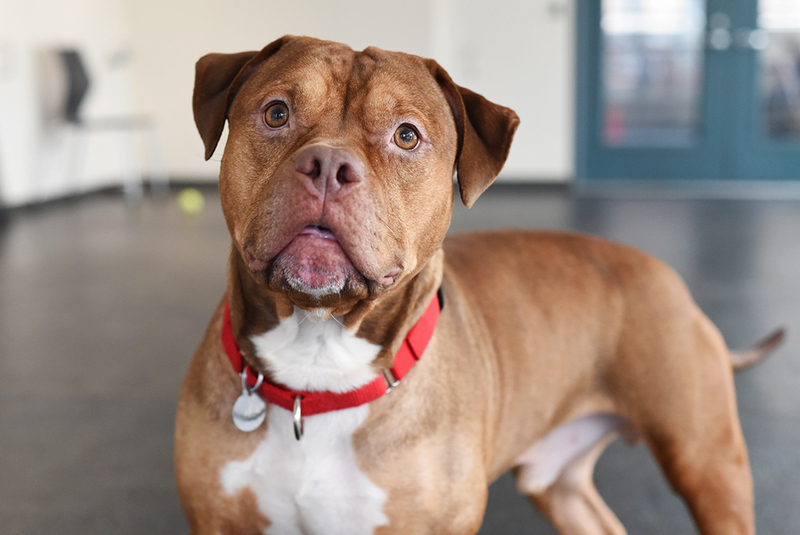 Juice, the big, bright-eyed dog was nothing like we remembered from his time at the ASPCA Adoption Center. Juice is now a beacon of happiness, love and loyalty—far from his sad beginnings. We met Juice on Christmas Eve, 2016. It was a time when many were celebrating with their loved ones, but Juice had been tied to a pole and abandoned on a construction lot. When NYPD officers brought him to the ASPCA, it seemed as though for Juice, it was a holiday miracle. Upon his arrival, the team at the ASPCA Animal Recovery Center (ARC) immediately set out to help the ailing dog who was underweight and suffered from unidentified bite wounds on his body, ear infections and a skin infection. Though we didn’t have many answers on his past, we were happy to help provide Juice with a brighter future—and show him the kindness and care he’d clearly been without. Juice during his stay at the ASPCA Adoption Center. A month went by and Juice began to heal. His wounds improved, and he began to fill out into the muscular, big boy we know today. In early February 2017, Juice was moved from ARC to the Adoption Center, and the search for his new home began. But we were faced with a challenge: Juice, like many dogs, did not acclimate well to life in a shelter setting. He was anxious and extremely vocal when potential adopters would walk by his enclosure. As you can imagine, this proved to be a deterrent for many, especially given Juice’s appearance and breed. 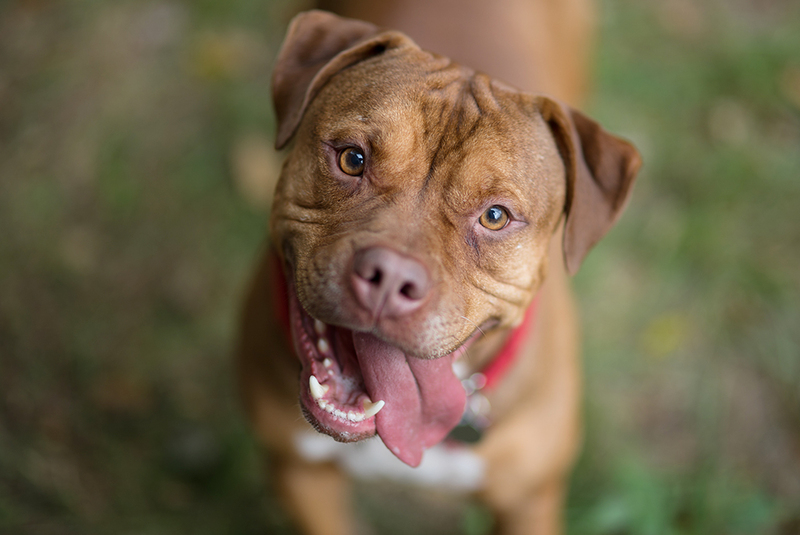 It’s no secret that pit bulls have a difficult time being adopted due to prejudice against their breed, and breed-specific legislation (BSL) put forth by lawmakers over the past years only fuels the all too often baseless fears. 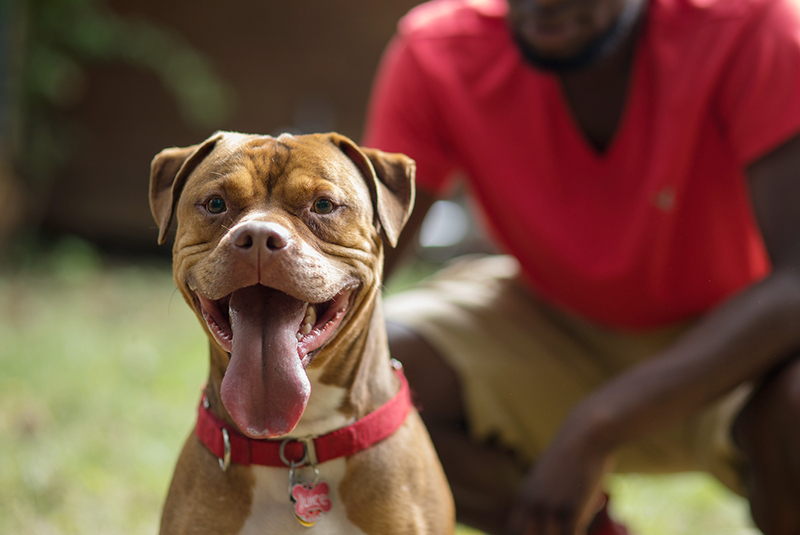 “Pit bulls have long been popular family pets, noted for their affection and loyalty, but you don’t hear much about gentle, loving pit bulls in the media because a well-behaved dog doesn’t make headlines,” says ASPCA President and CEO Matt Bershadker. Everyone at the ASPCA knew that there was more to Juice than met the eye; he was a loyal, affectionate goofball—he just desperately needed someone to see that, and to truly see him. 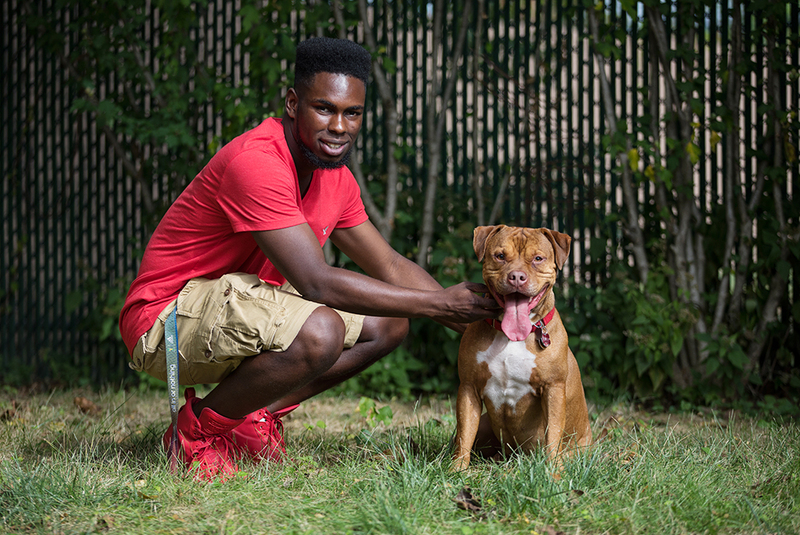 Months after Juice’s arrival to the Adoption Center, a young man named Gemar began a summer job working with the ASPCA. Gemar tells us that he spotted Juice on his first day at the Adoption Center, as he and the other new employees were given a tour of the facilities. He was intrigued by Juice, whose story resonated with him. Then, one night in May, a staff member took Gemar along for an inside walk and some playtime with Juice. 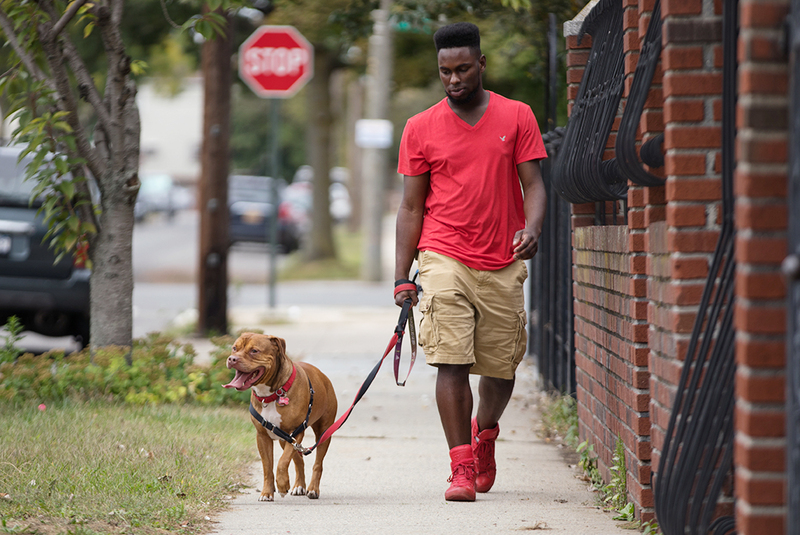 Gemar, a college student, lives in his family home in Queens and knew that he could give Juice a happy life. 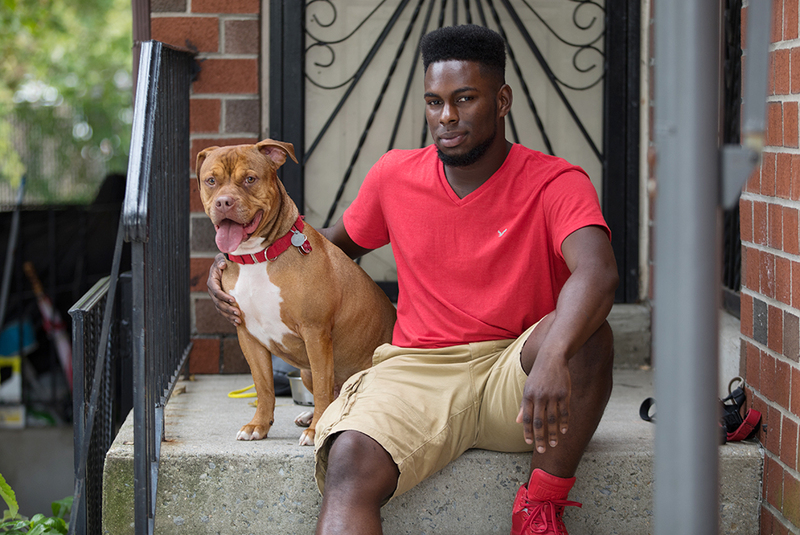 So, in June, Gemar made the adoption official, and after nearly six months of waiting, Juice was finally going home. It didn’t take long for Juice to get adjusted to his new home, surprising even Gemar with his behavior. “A lot of the behavioral issues that concerned us at first, like not being able to interact with other animals, he got over within the first week or two of being here,” Gemar tells us. “He’s a completely different dog than what he was in the shelter." But what are the benefits of adopting Juice? According to Gemar, there’s a long list of perks to being Juice’s dog dad. “All of my friends love him,” he says. “He’s very sweet and open. He’s quiet and polite. Overall, he’s just fun to have around and he’s always by my side.” At home, Juice’s favorite pastimes include running around his backyard, going on long walks and playing fetch with Gemar. Gemar knows that these dogs are often at a disadvantage based on stereotypes, but he hopes that people will one day realize that every dog is different. While Juice may have found his happy ending, there are still animals waiting to be adopted at your local shelter. Consider adopting this month, or visit our Find Your Fido campaign page to find out how you can make a difference in the lives of shelter dogs across the country.